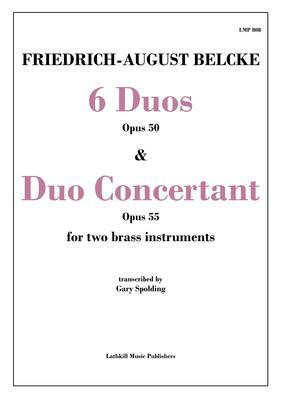 6 Duos Opus 50 and Duo Concertant Opus 55 by Friedrich-August Belcke transcribed for two brass instruments (originally written for trombone) are relatively unknown duets that are well worth exploring. The 6 Duos are simple study-like pieces, all in the key of Bb, that rely heavily on canonic imitation peppered with a few surprising twists. The Duo Concertant is a substantial and superb three movement sonata that rivals the Celebrated Duets of Saint-Jacome. Available in treble or bass clef. 21 pages in total - the 6 Duos are in score and the Duo Concertant is in separate parts.